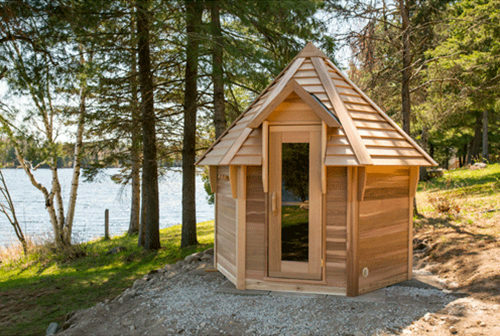 This unique barrel sauna concept makes our outdoor knotty cedar barrel saunas an exciting investment that generations can enjoy. Our Western Red Cedar barrel saunas have 1 1/2″ thick walls for a long natural insulation and the barrel design give you a much smaller heating area than any rectangular sauna with plenty of room for bathers. Canadian Knotty Cedar construction with solid wood cradles. The rubber roof options adds extra protection for water on the inside but is not required. Inside feed Harvia Sauna Heater with glass door.